Solihull is located in the West Midlands, towards the centre of England. It was created in 1945. The current member of parliament is the Liberal Democrat Lorely Burt, who has served since 2005. 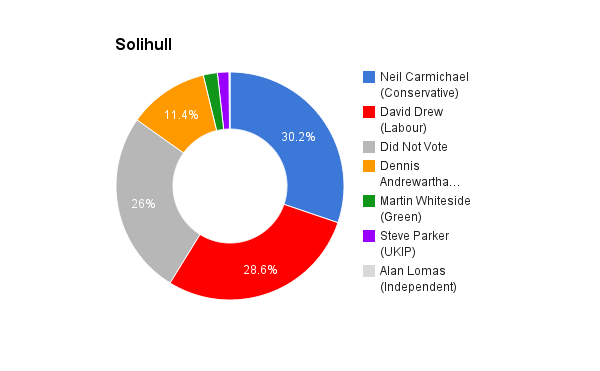 I am the Local Candidate with a long time relationship with Solihull. I have lived in and around Solihull nearly all my life. I bought my first home in Solihull over 30 years ago. I got married in Solihull and have brought children up here. 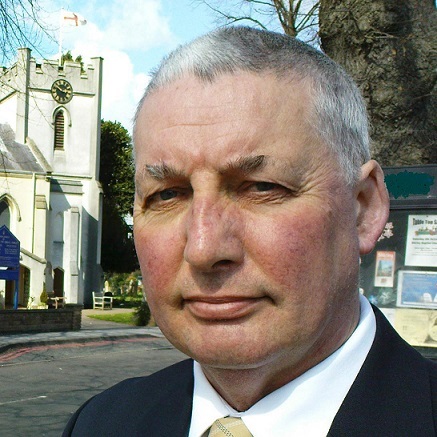 I have had the privilege of serving on Solihull Council since 2004 having been elected on four different occasions. I know well what is good and what needs to improve in Solihull. I have a record of standing up for the residents I represent and protecting and enhancing the environment. I am the Green Party Spokesperson for Business, Innovation and Skills. I fit the Green Party profile because I believe passionately that we need fairness in our society and should not live for ‘the now’ that results in a selfish society and increases inequality. I have children and grandchildren and want them to inherit a better world than we currently have. I am passionate about children’s welfare and education being a former foster carer in Solihull and an Ofsted school inspector. I am concerned about the privatisation of national institutions such as the NHS, our railways and the Royal Mail. I feel taking profits out of such institutions makes no sense and surpluses could be much better used ploughed back to improve services or keep costs down. I believe wealth should be more equitably shared in society. It is totally wrong that we have more than 2000 bankers paid over £1,000,000 million a year and most Corporate Directors of local Councils are paid more than twice as much as an MP. I obviously feel the Green Party has the best policies to offer; something that has been confirmed by national polls. Equally important is my record of standing up for those who I represent. Unlike other parties we do not operate a whip system so I always can vote with my conscience and would continue to do so as the MP for Solihull. In her first term the current MP was a strong voice for Solihull. She still is excellent with individual case work and has the utmost respect from those she has helped in her two terms. Unfortunately, her credibility has been damaged by being part of the coalition government and having to vote against what must be often her natural instinct. Austerity is not working. Inequality is widening due to the Government rewarding top earners with tax cuts whilst punishing those who are dependent, often through no fault of their own, on the welfare system. Austerity delayed any recovery. Hopefully, we are now coming out of recession (when wages for those on average and low incomes will exceed prices) but this is only the result of the natural economic cycle. Neither. We should not be legislating just to stop people coming here. Foreign students and visitors should be made to feel welcome. I don’t subscribe to the view that we need an influx of immigrants to prop up sectors such as the hotel industry and NHS. We should encourage people to take up jobs in traditionally ‘low paid’ industries and we should plan to train the skilled people we need such as nurses and doctors rather than continually sourcing from abroad. Easy; immediately raise the minimum wage to the level of the Living Wage (£7.85 in Solihull), so people can buy the basics for themselves and not be dependent on welfare to top up their earning. We are currently subsidising the large corporates, such as supermarkets, who pay minimum wages thus forcing the rest of us to subsidise their wage bill making up their workers take home pay to a level where they can live. Stop the privatisation that has seen billions of pounds worth of contracts outsourced and millions of pounds transferred out of the NHS to shareholders. Let local people have a greater say in what services are provided and where. Support people to live at home. Ensure A&E services are not abused. Extend the level of preventative initiatives. Better prepare for our aging population. Don’t stand back and expect the private sector to create jobs. Provide incentives to employers such as NI holidays and reductions in corporation tax for employers who take on new employees. Provide training that is relevant. If we are short of doctors and nurses, train doctors and nurses; when we can forecast an increase in demand, such as teachers, plan to meet it. Stop extending the retirement age, people working longer means less job opportunities for those setting out. Definitely! Embarrassingly, from someone who fits much of the stereotype. However, I do feel my lifetime experience of work does stand me apart from the career politician most despise. An important issue and one I feel that needs to be tackled sooner rather than later. I would be happy for an EU referendum at the same time as the General Election. I firmly believe in Europe and the benefits it can bring in many areas including planning to combat climate change, guaranteeing employee welfare rights, opening up economic markets and tackling pollution. I would obviously be encouraging constituents to vote to stay in the EU and in Solihull we have a very good illustration of the economic benefits it brings with Jaguar Land Rover producing excellent products and providing many jobs for the area.